Paul Walker, actor and star of the "Fast & Furious" movies died in a car crash today. He was a passenger in a single vehicle accident in Southern California. The red Porsche Carrera GT, driven by his friend, Roger Rodas, struck a tree and light pole in Valencia, Santa Clarita, California. Both men died at the scene. Walker was returning from a charity event to benefit the victims of the recent Typhoon Haiyan in the Philippines as part of an organization he founded, "Reach Out Worldwide". Paul Walker was loved by friends, other actors and fans. One reason for likability was his high sincerity quotient. 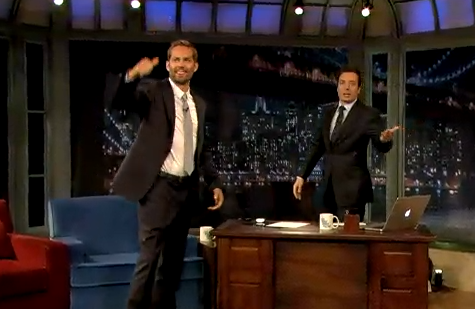 A little appreciated nonverbal signal of high sincerity can be seen at the beginning of the above video when Walker recently appeared on "Late Night with Jimmy Fallon". Note at 0:24, just before he sits down, a "Tongue Jut" (aka "Lizard Tongue") can be seen. When clustered with specific other nonverbal signals, a tongue jut signifies excitement or self-deprecating humor. Although not the case here a tongue jut can indicate "I've been bad", "I just got caught", "I've done something foolish" or "I just got away with something". Do you know how to tell these tongue juts apart? Rest in peace Paul Walker. You will be missed.